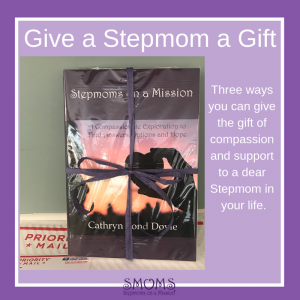 Empowering & Supporting Stepmoms Since 2000. Got a Narcissist in your life? Not sure? A lot of stress is caused when stepkids (or their bio-mom) behave in ways that don’t seem fair, rarely make sense, break the “rules,” seem ridiculous or at an extreme are enraging and have huge negative impact on a Stepmom and her partner. At first it’s a natural reaction to try to “get” others to change. However, at some point we all realize that trying to control others never works out well. Dealing with someone with narcissistic tendencies can be downright crazy-making and cause an almost unfathomable stress for a Stepmom and her partner. But how can you figure out if you’re dealing with someone with narcissistic tendencies? While we may never know exactly what our stepkids or their bio-mom are thinking, feeling, dealing with, suffering from or diagnosed with, at SMOMS we focus on (and take responsibility for) how we can respond to the behavior of others in ethical, effective, self-respecting ways. Understanding what you’re dealing with and learning effective ways to respond to previously upsetting behaviors in new relaxed, confident ways is usually cause for great relief and celebration. Do you suspect your stepkids or their bio-mom are behaving in narcissistic ways? Here’s a quick way for you to find out. Find out in 26 minutes or less. Chapter One is free! How did Cathryn get the job of narrating this book? She approached the author to study the book in greater detail and then asked about the chance to narrate this book to give as many people as possible the chance to learn and benefit from all the wisdom packed in this book. In the link below you can listen to the first Chapter of Eleanor Payson’s ground-breaking work—The Wizard of Oz and Other Narcissists: Coping with the One-Way Relationship in Work, Love, and Family—to understand a possible narcissist in your life. Listen to Cathryn read Chapter One of The Wizard of Oz and Other Narcissists: Coping with the One-Way Relationship in Work, Love, and Family for free! Buy entire audiobook on I-tunes, Audible.com or Amazon! Paperback & e-book versions also available. Here are the 2 listener reviews from Audible.com(FYI) please listen and decide for yourself. You’ll know if this book can help you by the end of the free clip. I want to thank the author (and the narrator) of this audiobook for putting into words what I believe is one of the most damaging and painful relationships one can ever experience. I finally understand what true narcissism is and how to recognize and avoid the narcissist in our lives. I highly recommend the audio version. I prefer to listen while I’m commuting to work or doing household chores. The author has provided detailed abundant information and having a narrator with a clear, pleasant voice made it very easy to listen and absorb. I feel free in knowing that we can never really please these people and it wasn’t my fault at all! I found this book to be very enlightening as well as informative. We are all surrounded by many people whose goal is to control us and all situations. The examples found in The Wizard of Oz and other Narcissists points out not only the techniques that these folks use, but also practical advice on how to protect ourselves from their games. Another very interesting thing about the book is the encouragement to take charge of ourselves – while gently being forced to look at ourselves and question whether we too are sometimes guilty of using the same techniques to control others. I was shocked to find out that the author, Eleanor Payson was not the narrator of the audiobook. Cathryn Bond Doyle has a calming and confident voice. It was comforting as I listened to each chapter. Not sure how she was chosen to narrate, but excellent choice! I have read the book in paperback, downloaded it on my iPad and now am purchasing it for my iPod. I had a dear friend recommend this book to me after sending her a plea of help. I was dealing with a woman in my life that was Narcissistic and had me running around like a chicken with it’s head cut off. After reading this book, and with my friends support and love…I FINALLY found some peace to know that I WAS NOT CRAZY!!! And some wonderful tools to cope with the Narcissistic people I wanted in m life and gain control over my emotions and actions. Having the AUDIO book makes it so much easier for me to review certain skills and help get me back on track when I start letting my boundaries slack with the NPD individuals in my life. If you have someone in your life that you feel may be Narcissistic…YOU WILL NOT REGRET getting this on Audio, paperback or ebook. It has changed my life and CAN change yours!!!! 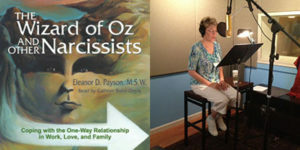 Buy entire audiobook—The Wizard of Oz and Other Narcissists—on I-tunes, Audible.com or Amazon! Paperback & e-book versions also available. Invest in Yourself & Feel Better.